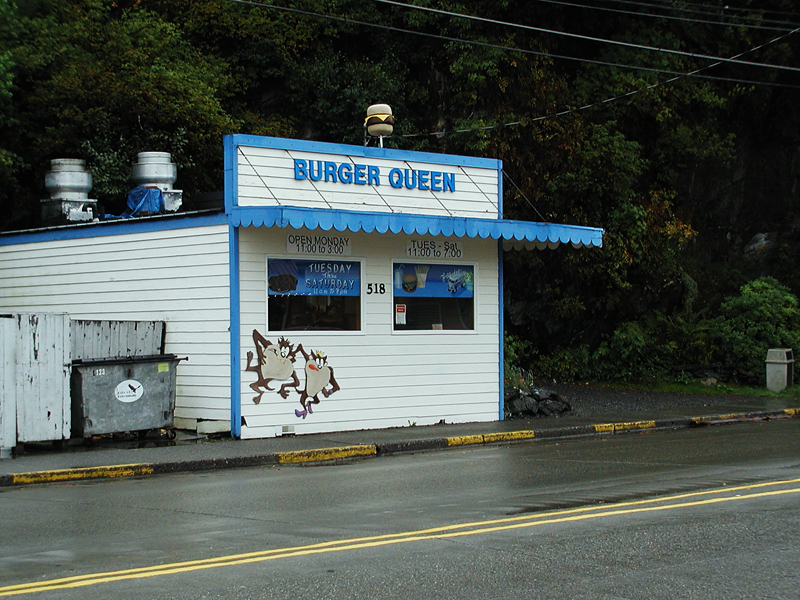 The next stop on our Alaskan culinary delights trail is a small house (a step up size wise from Tracy’s King Crab Shack) that is a treasure among the locals in Ketchikan, Alaska – Burger Queen. Despite the very unassuming façade and being slightly off the beaten path, Burger Queen has the best cheeseburgers I’ve ever eaten. I’m not even a big fan of cheeseburgers as a whole, yet Burger Queen always cooks them to such perfection and offers such a wide array of burgers that I looked forward to visiting Ketchikan just to pick one up. The Seattle Burger is a beast with cheese, ham, bacon, mushrooms and onions. They also offer options like veggie burgers and the Solidarity, made out of Polish sausage. My favorite has always been the plain cheeseburger with mushrooms. Now that you’ve got your burger chosen, there are still the sides to tackle! I wasn’t lying when I mentioned that I am not a burger fan. The first time I went to Burger Queen was actually because a friend promised me that they had some of the best onion rings she’d ever had. True enough, Burger Queen does not disappoint! The onion rings are absolutely mouthwatering! If for some weird reason you head over to Burger Queen but don’t want a burger, you can also select from a wide variety of chicken dishes – the ever popular chicken strip, the chicken strip sandwich, and different kinds of teriyaki chicken. And, of course, you can’t get away from fish anywhere in Alaska. This isn’t always a bad thing. Burger Queen also features some halibut meals – which is not surprising, since you can pretty much spit out their front door and hit the Pacific Ocean. To round out your meal, you have to pick from one of their 8,435,365,363 milkshake flavors. OK, that might be a bit of an exaggeration, but there are a ton. They change regularly, so they’re listed on a white board inside the door…but they are always delicious. It’s a classy establishment. And by classy establishment I mean, it does have a Facebook page. And, if you want to check out their menu there, you can. It is literally two off kilter iPhone-ish pictures of their menu. If you are there Sunday or Monday, you also have to catch them in their very tiny window of operation 11:00 am – 3:00 pm. What, you say? How can they survive on four hours of work? Because pretty much every single Ketchikan local orders their lunch from there. And that’s saying something. 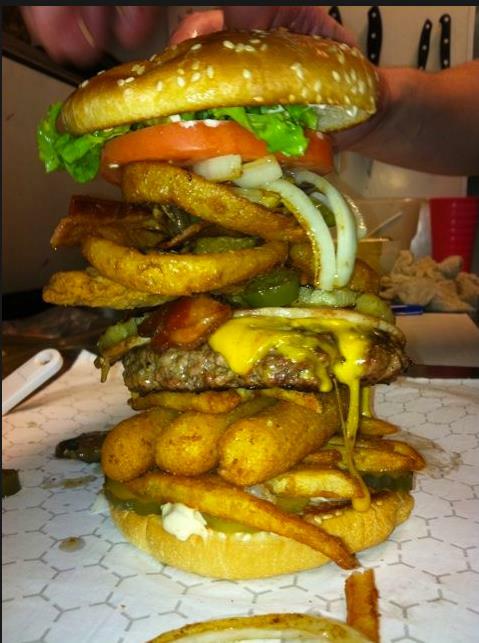 It’s saying it’s delicious… and that you had better be prepared to wait a little while for your burger. Everything is cooked fresh and that takes a little time. So, settle down in one of their booths – or on the rare sunny Alaskan summer day, one of the outside picnic tables – and check out the street scene. Alaskan locals are sometimes a show unto themselves…then again, so are all the tourists. Wondering how to get to Burger Queen? From the main cruise ship dock, if your left side is on the side of the water, you want to walk straight down Front Street, past Tongass Trading Company. Make a left onto Water Street and it will be on your right. It’s only abut a 5 minute walk and it’s hard to miss. You know what else is hard to miss? Our $100 gift card giveaway! Check it out and enter below!